A class to facilitate interaction with physical boundary conditions. ProblemDomain is a class which facilitates the application of physical boundary conditions, both periodic and non-periodic. 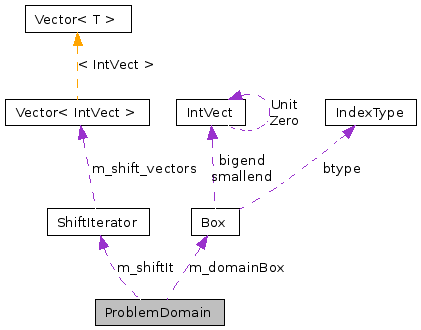 This class contains much of the functionality of the Box class, since logically the computational domain is generally a Box. Intersection with a ProblemDomain object will result in only removing regions which are outside the physical domain in non-periodic directions. Regions outside the logical computational domain in periodic directions will be treated as ghost cells which can be filled with an exchange() function or through suitable interpolation from a coarser domain. Since ProblemDomain will contain a Box, it is a dimension dependent class, so SpaceDim must be defined as either 1, 2, or 3 when compiling. Note that this implementation of ProblemDomain is inherently cell-centered. The default constructor. The constructed domain box is empty. Construct ProblemDomain with a_domBox as computational domain. Construct ProblemDomain with specified lengths. Returns the logical computational domain. Returns true if BC is periodic in direction a_dir. Returns true is BC is periodic in _any_ direction. Returns the shiftIterator for this ProblemDomain. Returns true if this ProblemDomain is empty or undefined. Return the size of the domainBox in the specified coordinate direction. Return the size of the domainBox. Returns true if argument is contained within this ProblemDomain. Returns the periodic image of this IntVect inside of the ProblemDomain. Returns true if this ProblemDomain and the argument intersect. Returns true if this argument is adjacent to a periodic boundary. Returns true if box1 and box2 or any of their periodic images intersect. Returns true if the two domain are equivalent. Returns true if the two domain are not equivalent. Sets whether BC is periodic in direction a_dir (true == periodic). Grows (or shrinks) the domain Box by i in all directions. Grow this ProblemDomain on the low side. Grow this ProblemDomain on the high side. Returns the Box intersection of this ProblemDomain and a_b. Gives more detail than printOn. Modifies a_box to be the intersection of a_box and a_probdomain. Returns a Box which is the interesection of a_box and a_probdomain. Returns a ProblemDomain with a domainBox grown by the given amount. Returns a grown version of pd. Returns a face-centered Box at the low side of a_pd. Returns a face-centered Box at the high side of a_pd. Returns the cell-centered Box adjacent to the low side of a_pd. Return a ProblemDomain which is a refinement of a_probdomain. Write an ASCII representation to the ostream. a_isPeriodic is a SpaceDim array of bools; if true, the physical boundary condition is periodic in the coordinate direction. False means a non-periodic BC. It is an error if small is greater than big. Defaults to non-periodic domain. It is an error if small is greater than big. a_isPeriodic is a SpaceDim array of bools; if true, the physical boundary condition is periodic in the coordinate direction. False means a non-periodic BC. It is an error if the lengths are negative. Defaults to non-periodic domain. It is an error if the lengths are negative. a_isPeriodic is a SpaceDim array of bools; if true, the physical boundary condition is periodic in the coordinate direction. False means a non-periodic BC. Referenced by contains(), MultiGrid< T >::define(), BaseIFFAB< T >::define(), BaseEBFaceFAB< T >::define(), and ViscousTensorOp::getFlux(). Referenced by BaseIFFAB< T >::define(). The shiftIterator is defined based on the periodicity of this ProblemDomain. An empty ProblemDomain does not contain and is not contained by any ProblemDomain, including itself. Note also that in a periodic Direction, any index is valid, since the domain is infinite in that direction. References Box::bigEnd(), isEmpty(), m_domainBox, m_isPeriodic, and Box::smallEnd(). Referenced by contains_box(), and image(). References Box::bigEnd(), contains(), Box::contains(), m_domainBox, m_isPeriodic, Box::size(), and Box::smallEnd(). An empty ProblemDomain does not contain any Box. An entirely periodic domain contains any Box. References Box::bigEnd(), domainBox(), Box::enclosedCells(), isEmpty(), m_domainBox, m_isPeriodic, IndexType::NODE, Box::smallEnd(), SpaceDim, Box::surroundingNodes(), and Box::type(). It is an error if a_box is not cell-centered. An empty ProblemDomain does not intersect any Box. This will do nothing in periodic directions (since a periodic domain is infinite in the periodic direction. If periodic in all dimensions, this will always return true. It is an error if a_box is not cell-centered. This routine does not perform the check to see if *this or b are empty Boxes. It is the callers responsibility to ensure that this never happens. If you are unsure, the use the .intersects(..) routine. In periodic directions, will always return true. References m_domainBox, m_isPeriodic, and SpaceDim. References m_domainBox, m_isPeriodic, m_shiftIt, and SpaceDim. Modifies this ProblemDomain by growing it on the low and high end by n_cell cells in direction idir. Modifies this ProblemDomain by growing it on the low end by n_cell cells in direction idir. The intersection of the Empty ProblemDomain and any Box is the Empty Box. This operator does nothing in periodic directions (since a periodic domain is an infinite domain). Modifies this ProblemDomain by refining it by given (positive) refinement ratio. The Empty ProblemDomain is not modified by this function. Referenced by AMRTGA< T >::AMRTGA(), BaseLevelTGA< T, TFlux, TFR >::BaseLevelTGA(), and AMRMultiGrid< T >::define(). Modifies this ProblemDomain by coarsening it by given (positive) refinement ratio. The Empty ProblemDomain is not modified by this function. Modifies this ProblemDomain by coarsening by given (positive) refinement ratio. The Empty ProblemDomain is not modified by this function. References m_domainBox, m_shiftIt, Box::shift(), and Box::size(). Useful for exiting due to an error. Returns a ProblemDomain that is the argument ProblemDomain with a DomainBox grown by the given amount. Returns the edge-centered Box (in direction a_dir) defining the low side of the argument ProblemDomain. The output Box will have the given length in the given direction. Directions are zero-based. It is an error if not 0 <= dir < SpaceDim. The neighbor of an Empty ProblemDomain is an Empty Box of the appropriate type. If a_dir is a periodic direction, will return an empty Box. Returns the edge-centered Box (in direction a_dir) defining the high side of the argument ProblemDomain. The return Box will have the given length in the given direction. Directions are zero-based. It is an error if not 0 <= dir < SpaceDim. The neighbor of an Empty ProblemDomain is an Empty Box of the appropriate type. If a_dir is a periodic direction, will return an empty Box. Returns the cell centered Box of the given length adjacent to the argument ProblemDomain on the low end along the given coordinate direction. The return Box is identical to the argument ProblemDomain in the other directions. The return ProblemDomain and the argument ProblemDomain have an empty intersection. Directions are zero-based. It is an error if not 0 <= dir < SpaceDim. The neighbor of an Empty ProblemDomain is an Empty Box of the appropriate type. If a_dir is a periodic direction, will return an empty Box as well. Returns the cell centered Box of the given length adjacent to the argument ProblemDomain on the high end along the given coordinate direction. The return Box is identical to the argument ProblemDomain in the other directions. The return Box and the argument ProblemDomain have an empty intersection. Directions are zero-based. It is an error if not 0 <= dir < SpaceDim. The neighbor of an Empty ProblemDomain is an Empty Box of the appropriate type. If a_dir is a periodic direction, will return an empty Box. Returns a ProblemDomain that is the argument ProblemDomain refined by given (positive) refinement ratio. The Empty ProblemDomain is not modified by this function. Returns a ProblemDomain that is the argument ProblemDomain coarsened by given (positive) refinement ratio. The Empty ProblemDomain is not modified by this function. Referenced by contains(), image(), isPeriodic(), operator=(), operator==(), and ProblemDomain(). Referenced by contains(), domainBox(), grow(), growHi(), growLo(), image(), isEmpty(), operator=(), operator==(), shift(), shiftIt(), size(), and unshiftIt(). Referenced by operator=(), shiftIt(), shiftIterator(), and unshiftIt().